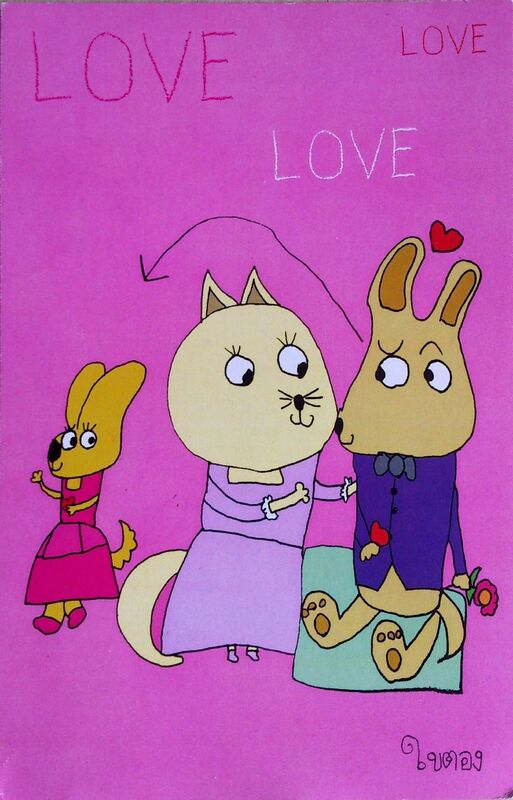 This one comes from Natalya from Russia. 🙂 The card pictures the head of Buddha in Wat Mahathat, part of the Ayutthaya historical park. 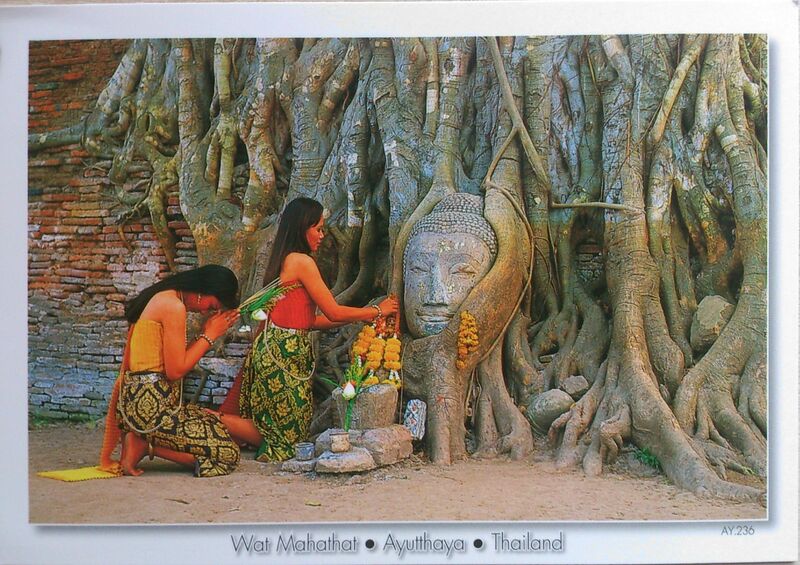 The Ayutthaya historical park covers the ruins of the old city of Ayutthaya, Thailand. The city of Ayutthaya was founded by King Ramathibodi I in 1350 and was the capital of the country until its destruction by the Burmese army in 1767. In 1969 the Fine Arts Department began with renovations of the ruins, which became more serious after it was declared a historical park in 1976. The park was declared a UNESCO World Heritage Site in 1981. Thirty-five kings ruled the Ayutthaya kingdom during its existence. 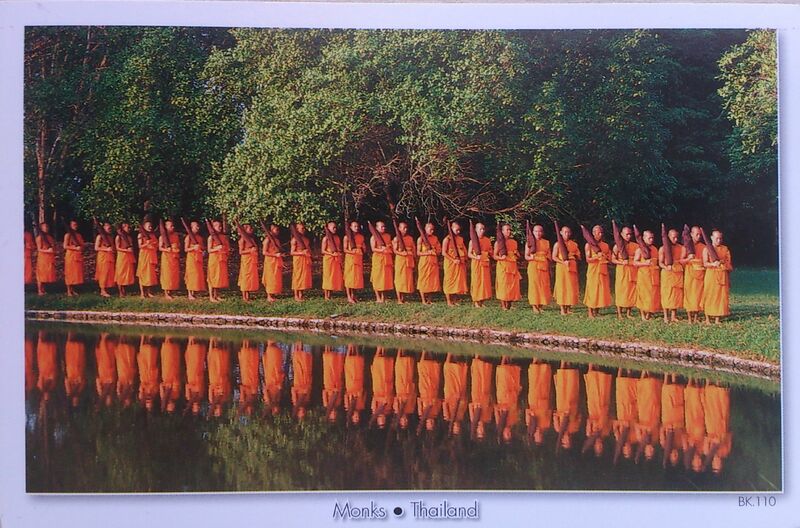 4.00 am – The monks wake up and meditate for one hour, followed by one hour of chanting. 6.00 am – The monks walk barefoot around the neighbourhood while the local people make merit by offering them food. 8.00 am – Returning to the temple, the monks sit together to eat breakfast, then make a blessing for world peace. Before 12.00 noon – Some monks choose to eat a light lunch at this time. This is the last solid food they are allowed to consume until sunrise the following morning. 1.00 pm – Classes in Buddhist teaching begin. Some monks may attend school outside the temple. 6.00 pm – A two-hour session of meditation and prayer begins. 8.00 pm – The monks retire to do homework. The Burma Railway, also known as the Death Railway, the Burma-Siam Railway, the Thailand–Burma Railway and similar names, was a 415 kilometres railway between Bangkok, Thailand, and Rangoon, Burma (now Yangon, Myanmar), built by the Empire of Japan in 1943, to support its forces in the Burma campaign of World War II. 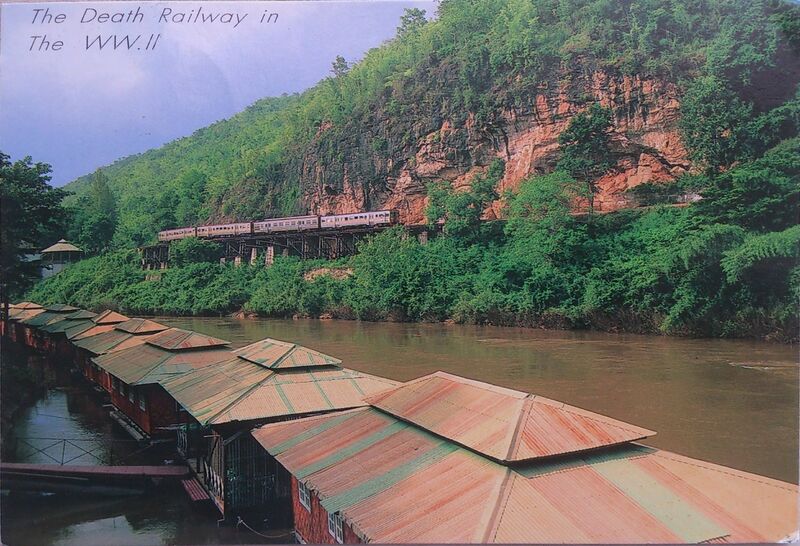 The line was closed in 1947, but the section between Nong Pla Duk and Nam Tok was reopened ten years later in 1957. Forced labour was used in its construction. About 180,000 Asian labourers and 60,000 Allied prisoners of war (POWs) worked on the railway. Of these, around 90,000 Asian labourers and 12,399 Allied POWs died as a direct result of the project. The dead POWs included 6,318 British personnel, 2,815 Australians, 2,490 Dutch, about 356 Americans and a smaller number of Canadians and New Zealanders. 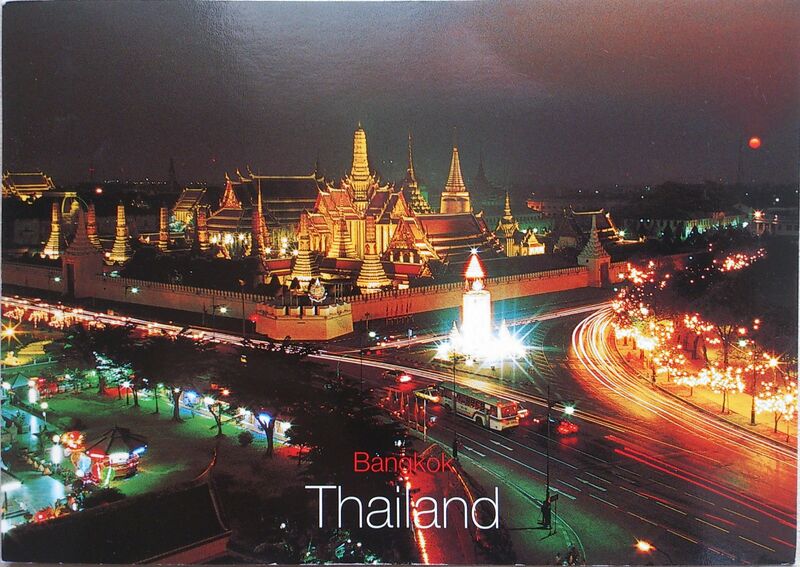 The construction of the Temple of Emerald Buddha started when King Buddha Yodfa Chulaloke (Rama I) moved the capital from Thonburi to Bangkok in 1785. Unlike other temples, it does not contain living quarters for monks; rather, it has only elaborately decorated holy buildings, statues, and pagodas. The main building is the central ‘ubosot’ (ordination hall), which houses the Emerald Buddha. Even though it is small in size, it is the most important icon for Thai people.